Ramp Riot! Goodbye Recycle Rush! On Saturday, November 14, 2015, The RoboLancers attended Ramp Riot! It was the last Recycle Rush competition of the year and the highlight of our off season. Ramp Riot! had one the largest RoboLancers attendance rates for any FRC competition this year. Many FTC members, FRC members, teachers and mentors attended this event. While it was a goodbye to another game for the FRC members, it was an introduction for our new FTC members. As Recycle Rush was going on, an FTC Scrimmage was also taking place at Wissahickon High School. This year’s FTC game, Res-Q, allows teams to think more creatively due to the verticality of the field. 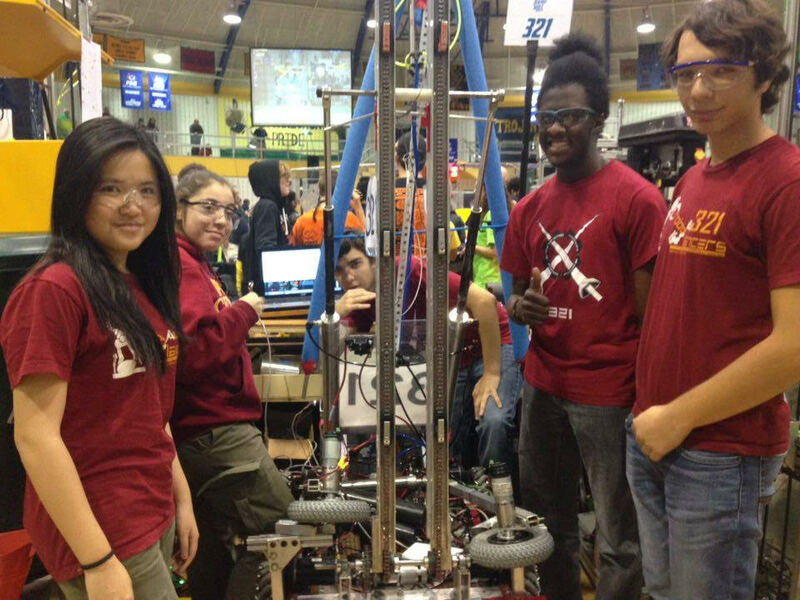 The scrimmage allowed exposure of other teams as well as the progression of their robots. “It was interesting to see the other teams’ approaches to the various challenges that this game presents… one of the teams even designed and built the same type of manipulator as us!” Connor McCole, a member of Central’s FTC Crimson team, said. Experiencing a competition of this magnitude, new FTC member Thomas Swingley comments, “We went between the FTC and FRC areas, looking at how the FTC games went and watching the 321 FRC team during their matches. Our team, as well as others, cheered for each team and alliance.” All our members were exhilarated to watch and cheer for our team’s matches. The pompom wiggling and chants were led by Martis Ravenell and Sabrina Dormer. “Sabrina and I leading and coordinating the members in the stands gave spirit to our drive team as they faced the perils of the drivers’ station. When my fellow first year FRC member, Viwing Zheng, took over as the manipulator controller, the entire stand decided to give her a giant cheer in order to cheer her on,” says Martis Ravenell. A lot of people expressed excitement for the end of off season, and for the start of the incoming build season. With the end of Ramp Riot, the 321 RoboLancers bid adieu to Recycle Rush. Below, are some thoughts from our senior and junior members: Jeechieu Ta, Evan Aretz, Brian Mata, Jonah Getz, Ahmed Amin, and Cordell Beatty. These are all members of the RoboLancers’ Executive Committee, and lead certain factions in the team. Our President, Caspar Nguyen, personally interviewed FRC members who experienced the 2015 FRC game Recycle Rush! – How do you feel about Ramp Riot being the last game of Recycle Rush? JC: I’m happy that it’s over. There was excitement that this was the final game. EA: I’m ready for this new robot. While Recycle Rush was the best robot that I (helped (a lot)) build so far, I was juggling with mechanical and Chairman’s. JG: Relieved. No more mechanums! CB: It feels great to end Ramp Riot and be done with Recycle Rush forever. I wasn’t a fan of the free for all aspect. That being said, it was an amazing year, being able to go to World’s for the first time and winning 2 blue banners. – What are your expectations for the next game “FRC Stronghold”? JC: I hope that it can be a game that we could be comfortable going to World’s about. Last year’s seniors were a little uncomfortable that Recycle Rush was going to their last game. Hopefully, FRC Stronghold will be a bumpers kind of game. CK: I know that Cordell would be excited about it if it does become that way. He was a sophomore when he was on the drive team for the FRC offseason of Aerial Assist, and was a very good defensive driver for our defensive robot. EA: I hope that it’s not going to be bad. I want it to be more high-paced. It was only high-paced when you had a really good robot. The scoring system wasn’t very fun. I want more high tension situations where I could be more nervous and anxious about the game but Recycle Rush was more of Recycle Mellow. BM: A lot of defense. I hope it was a more technical/challenging game than what Recycle Rush was. JG: It sounds cool. I look forward to having defense again. CB: I’m hoping stronghold game is the total opposite of this year’s game. I’m expecting heavy defence and some type of shooters. It’ll make for a better game to watch as a spectator. – How was it like to be cheering in the stands? JC: [On cheering in the stands] it wasn’t very exhilarating, but for the freshman, I’m sure that it was much more fun. CB: I tried to be in the stands as much as I could so I could watch and enjoy the last competition. CK: Lots of pom-poms. So many pom-poms. I wish that there were more dancing. From us, not so much about the other teams, but it’s always cringe-worthy to see kids do the Whip/Nae Nae from the spectating view of a Philadelphian. Otherwise, it was an FRC event, as it usually is. One of the better things being in the stands (now that I’m no longer Safety Captain, and therefore, am not as needed in the pits), helping coordinate spirit and doing match scouting, is hearing things from the drive team (when they come up to rest in between matches). I was talking with Cordell, who told me that when they were behind the driver’s station, he looked up (at where the team was), turned to Jonah, and said, “look at all of the people cheering for us.” He said it with such a big smile, and we’re a pretty big team, mind you. *laughs* I plan on getting some Drive Team cheers together for the upcoming season so our Drive Team knows just how much we truly do appreciate them. – What was it like in the pit at Ramp Riot? EA: Crowded. Tried my best to keep everything moving. “Aggressively coordinate.” Our team is pretty solid so I didn’t have to do anything. BM: It was exciting. It was nice to be working as the technical lead, especially after having been working as the lead’s assistant. CB: The Ramp Riot drive team experience was really good. All of the teams were excited that this was the last competition of the year. It wasn’t nearly as intense as during the normal season. This being our last competition we didn’t have much to work on in the pit. – What was it like being Head Scout and really getting into the game and the competition? AA: It gave me some experience. I feel that I will be very ready come 2016. We’ll be working further on our scouting techniques, and I will be completely revamping our scouting system. Our team has plenty of time on our hands until 2016’s FRC game Stronghold is released. The RoboLancers have been tinkering away on a similar robot from a past game. Updates soon to come!